Rafters visit Moab for quick access to some of the best whitewater and flat water paddling in Utah. Popular trips include Cataract Canyon, Moab to Potash Dock, Westwater Canyon, as well as Labyrinth and Stillwater Canyons. Find a whitewater rafting or scenic float trip to join during your vacation. Located in close proximity to the Green and Colorado Rivers, Moab is a rafters dream. Whether you’re looking for a relaxing flat water float, or a white knuckle whitewater roller coaster ride, you can find here in Moab. This 53 mile stretch of white water is home to rapids with names such as Wild Horse and Funnel Falls. The put in for this trip is at the Westwater Ranger Station, the take out is Cisco Landing. Also known as the Daily Section, Fisher Towers is a great section of whitewater for day trips. From Hittle Bottom to Take Out Beach, this 13 mile section offers Class I-III rapids. The Moab to Potash Dock section of the Colorado River provides a relaxing 15 mile float, and is accessible to people of all ages and ability levels. The Potash Dock to Spanish bottom section of the Colorado river is a great option for those who want to spend a few days enjoying the river, but don’t want to navigate intense whitewater. Boaters of all ages and ability levels will enjoy this float. If you’re looking for white water, Cataract Canyon is your destination. Boaters come to Cataract Canyon for a chance to experience over 112 miles of Colorado River fun, including some of the most challenging rapids in the United States. 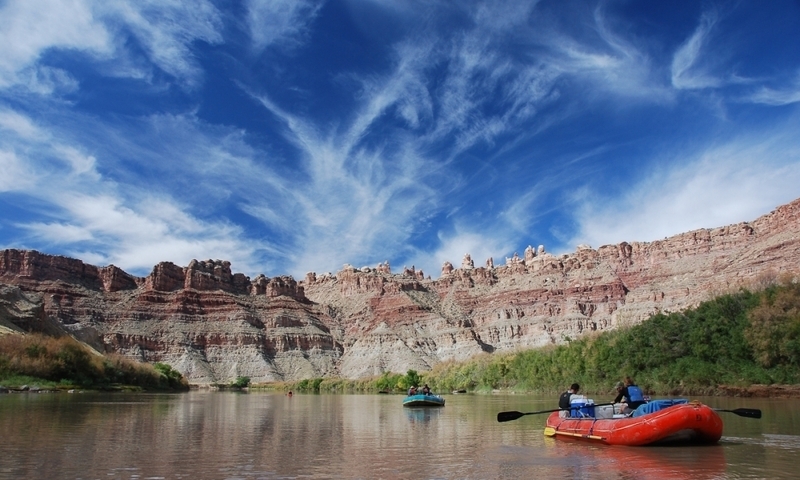 Labyrinth Canyon is home to 68 miles of beautiful flat water paddling. Along the route, marvel at breathtaking red rock canyons, and observe abundant wildlife, including deer, blue heron, American egrets and beavers. The area is also home to several prehistoric Native American petroglyphs. This trip is often combined with Stillwater Canyon to make for a 120 mile trip. Home to 52 miles of flat water, this trip passes through similar scenery as Labyrinth Canyon, but also includes Crystal Geyser, one of the only cold water carbon dioxide driven geysers in the world. Combine with Labyrinth Canyon for 120 mile trip. You will need permits to raft these sections of river. Call (435) 259-4351 for details. If you’re looking to make the most out of your Moab area rafting trip, hire one of the guides located on this page. They’ll take care of equipment and logistics so you can just enjoy your trip.